A second year Military Arts student in the Academy City of Zuellni & the Psychokinesist for the 17th platoon. 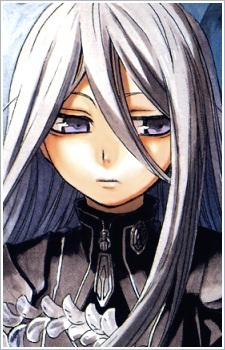 Felli is the younger sister of the Student Council President, Calian Loss. Because of her high level telepathic abilities, Calian forced her to join the Military Arts section against her will, as such she resents her brother and is rather reluctant to fight, not putting much effort into battles. She takes a liking to Layfon because, like her, the strength of his powers aren't normal, and he was forced into the Military Arts against his will as well. Despite her calm demeanor she is prone to physically abusing her brother or Layfon with kicks to the shins, should they anger or embarrass her. She calls Layfon by the nickname "Fonfon", and demands of him to in return call her Felli (without honorifics). Her powers consist of manipulating the petal-like segments of her Dite which she can use for searching, communication, and offense if necessary. Like most psychokinesists the massive amounts of information constantly entering her mind is too much for her to handle, resulting in her inability to make facial expressions except on rare occasions.